Here is part 6 on how to make a 8x5 pocket mini album with flaps and tags.In this video I will show how to decorate the 3. page backside finish with flaps using Graphic 45 beautiful Gilded Lily paper collection. There is a pocket inside the flap with a photo frame. Stamping on the backside of the pull out flap. The flap opends with more space for photos. 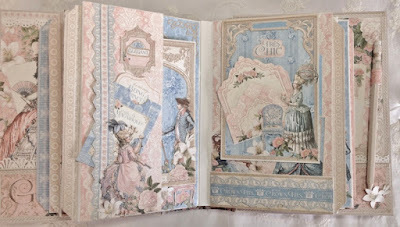 In the next part I will show how to make the 4 page and decorate the front. Stunning album !!! Love it!